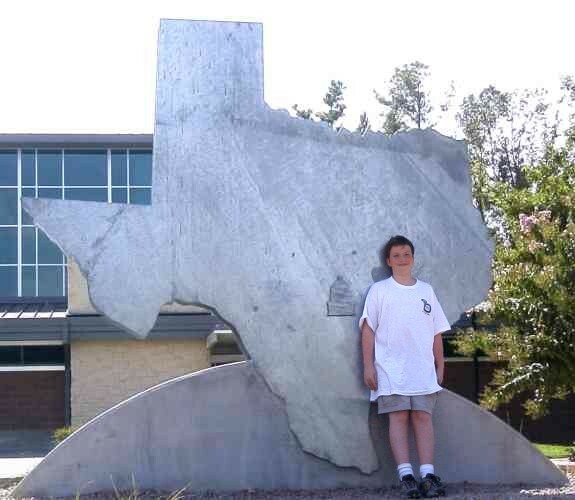 Years ago, when were back in Tennessee for a visit, Samuel Reed, my cousin Natalee's son, crawled up in the suburban with us and announced "I REALLY NEED to go to Texas!" Well Samuel finally made it as you can see. Angie had just gotten back from 3 weeks of vacationing with her family in California when we received the call that my only living Aunt, Lyda DeLoach, had finally succumbed to complications following heart surgery. We made a rush trip back to Tennessee to attend the services. Afterwards we decided to bring Samuel back to Texas with us for a visit before his school starts. Samuel wanted to see "downtown", so after a movie and dinner at Fuddruckers, we got Marguerita and Alex Flores to join us in a Dart Light Rail ride downtown. 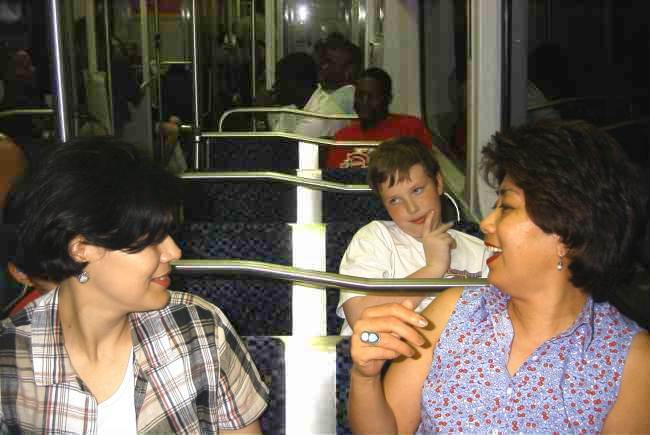 This was also Samuel's first time to ride a train, and a subway at that. While downtown we wandered through the West End Marketplace where the boys checked out a magic shop. 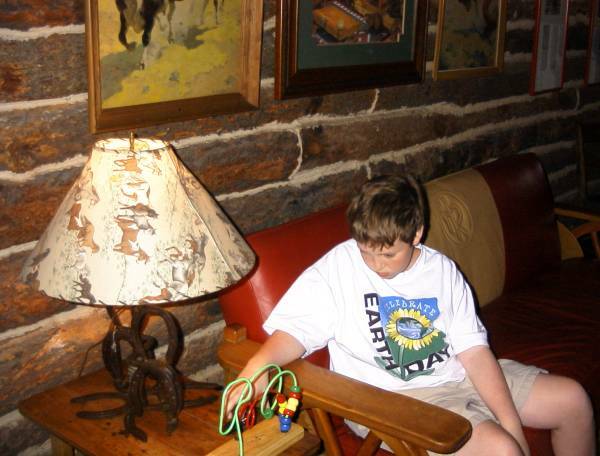 Then we went down to see John Neely Bryan's cabin and through Dealy Plaza to Union Station. We walked the tunnel over to the Reunion Tower, but the observation deck was closed for the evening. The boys had to content themselves with riding the glass elevators at the Marriott which give a spectacular view of Dallas themselves. We got so busy having fun that we missed the last train back to Richardson. We did catch one up to Park Lane where we summoned a cab to the nearby Seven-Eleven and rode back to Richardson. All in all, it was an adventurous evening. 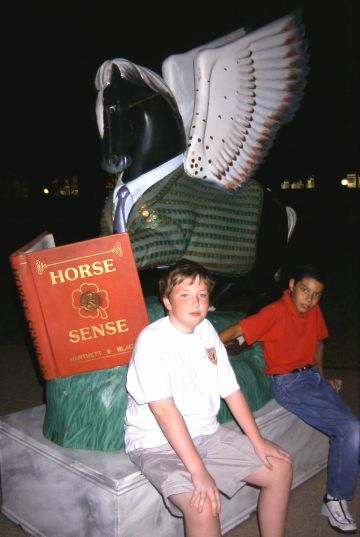 This picture caught the boys relaxing at one of the many Pegasus figures around Dallas. This one was just outside the Bryan cabin. 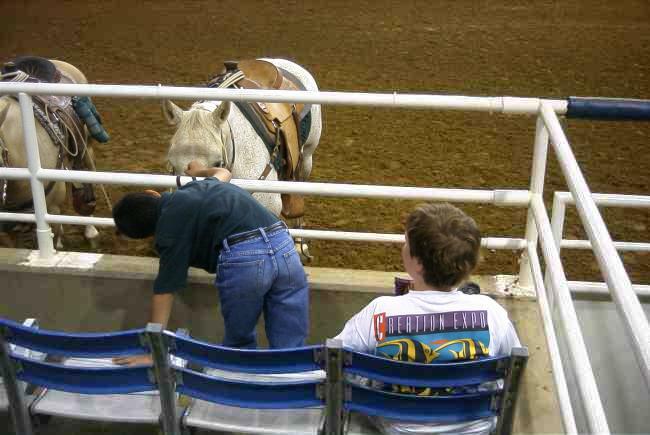 The following evening we took the boys to the Mesquite Rodeo. 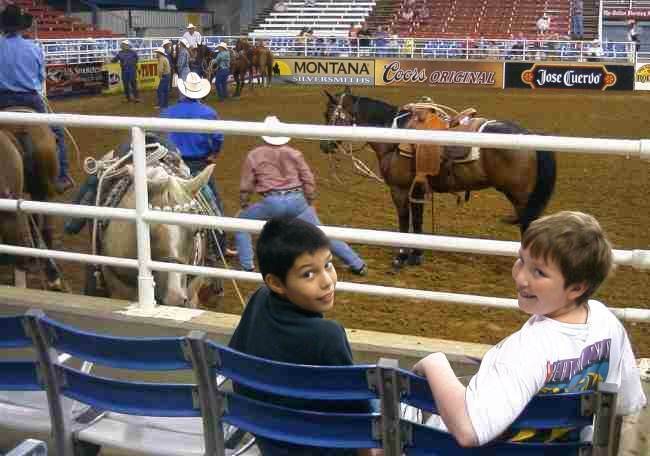 Turns out that Alex and his mother had never been to a rodeo either. After the regular performance was over, we stayed and watched additional competitors in calf roping. Samuel and Alex got a real ringside seat for this part. Alex even made a new friend. The cow ponies were gentle and happy to be petted. After eating at Luby's cafeteria and Spring Creek BBQ, Samuel wondered if there weren't places in Texas where people served you. We took him up to Hacienda Ranch where he got plenty of service and some good Mexican style catfish to boot. 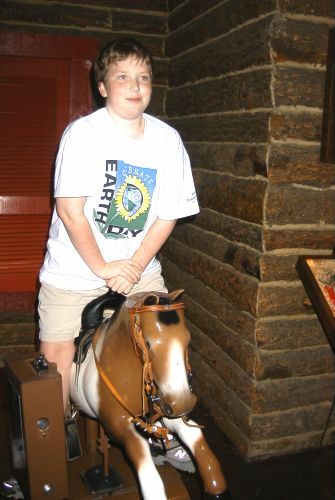 As we were leaving, Samuel decided that maybe he should ride a horse before leaving Texas. 50¢ took care of that! The poor little horsy almost died under that load! Monday we took the boys down to Fair Park and visited the Science Museum and took in an IMAX movie on "The Lost World". After dinner we took them over for swimming for a couple of hours. We all slept well that night.